With Nano finished and Christmas done and dusted for another year, I finally have a bit of free time to get back to blogging (one of many New Year’s Resolutions is to try and blog more regularly). The run-up to Christmas is always a bit manic, the big day itself tends to leave me somewhat frazzled – especially as it was my first time hosting the whole shebang this year – and with a new job and a move to London looming on the horizon in the next fortnight, 2013 looks to be getting off to a hectic start too! So thank goodness for the next few days, which are a much-needed holiday. I don’t have much planned, apart from catching up with some old friends. And today, I decided to spend some time with one of my oldest friends. Clara. She’s a clarsach (or clarseach, or clairseach…hence the name: Clara the Clarsach. What?! I did say that I was 11 when I got my harp!) 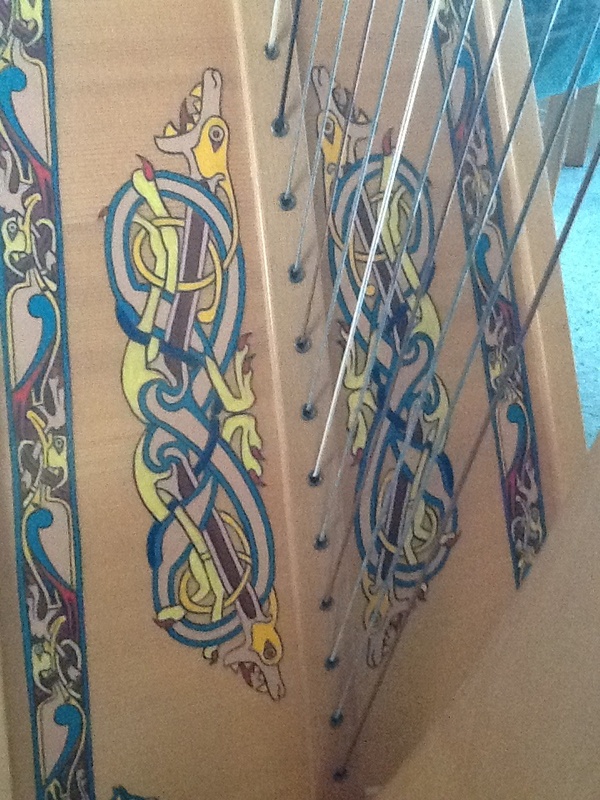 – a concert-strung, Celtic beauty with 34 strings, a maple frame and hand-painted designs on the side. 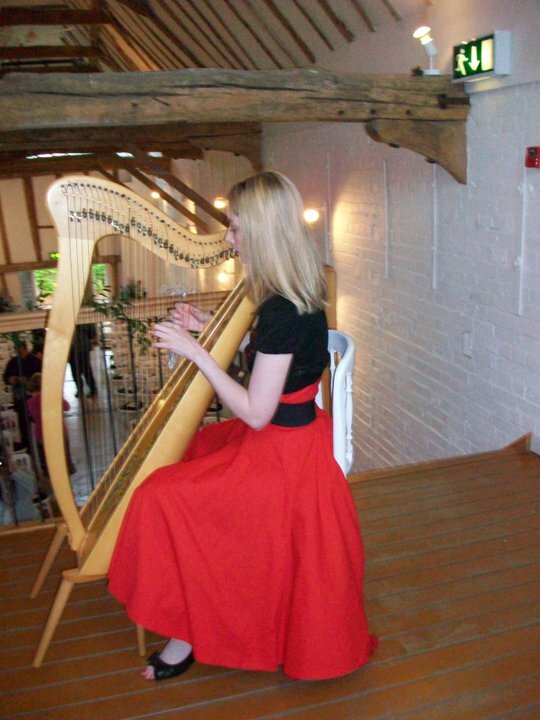 I’ve been playing the harp since I was 9 and, after 2 years of renting a harp from the local education board (yep, you really can rent just about anything! ), my parents decided that the harp and I were developing into a fairly serious relationship and that I should have one of my own. And so we went to Pilgrim Harps (www.pilgrimharps.co.uk) to find Clara. Over the past 20 years (great, now I feel old!) I’ve played, practised and performed at lots of different events from weddings to corporate Christmas dinners. However, I’m really not a natural performer, so in some ways the harp and I must seem like an odd fit. It’s a flashy instrument, a bit of a showstopper. When people come to visit, Clara does tend to attract attention and I sit there, waiting for the inevitable ‘go on, give us a tune’ comments to start. And, because people tend to get the wrong end of the stick and think I’m being really precious if I don’t play something, more often than not I’ll pluck a quick reel or jig and hope that will be enough. I’m an introvert – not at all a performer. I love playing as part of a group, or providing background music (that’s just adding atmosphere, people are too busy eating canapés and quaffing bubbly to really pay attention to the music – and that’s fine by me) but put me centre stage and things tend to fall to pieces. Faced with a solo performance, you can pretty much guarantee that my hands will be so clammy they’ll start to slip off the strings, I’ll make mistakes in pieces that I know by heart, and my right leg will start to shake uncontrollably (the left leg never gives me any such trouble!). Really, I would have been better off staying in the background with my recorder! That’s me playing at a (very good) friend’s wedding. I love being able to add something to such a special day and it's always lovely to be asked, but I’ll only do it if I have a) plenty of notice (i.e. plenty of time to practise, practise, practise) and b) it needs to be for a very good friend! So I love days like today. It’s just Clara and me. I have enough time to tune every one of those 34 strings, replace the ones that need to be changed, and play my way through a repertoire of old favourites and practise new pieces. I’m a fan of mixing it up, so I’m as likely to play Death Cab for Cutie or Bob Dylan, as I am a traditional Irish air. I’m hugely in favour of everyone having a ‘selfish’ hobby like this. My harp is just for me and it’s really just for my own enjoyment. Practising makes me happy (and a better harper!) and that’s it. It doesn’t keep me fit or help me to lose weight. It doesn’t make me more intelligent. It’s a million miles away from my 9-5 office life and won’t improve my career prospects. It doesn’t benefit anyone else apart from me. And, I think that's okay. Sometimes, a little bit of selfishness is just what the doctor ordered and, after an afternoon with my harp, I'm feeling relaxed, happy, and just about ready to start tackling the chore that is packing for our move to London!